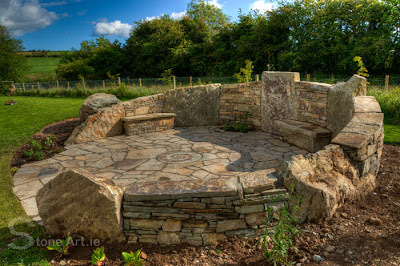 Here is a picture of a project I recently finished for an artist in West Cork. The mosaic in the center was actually a bit of an afterthought. 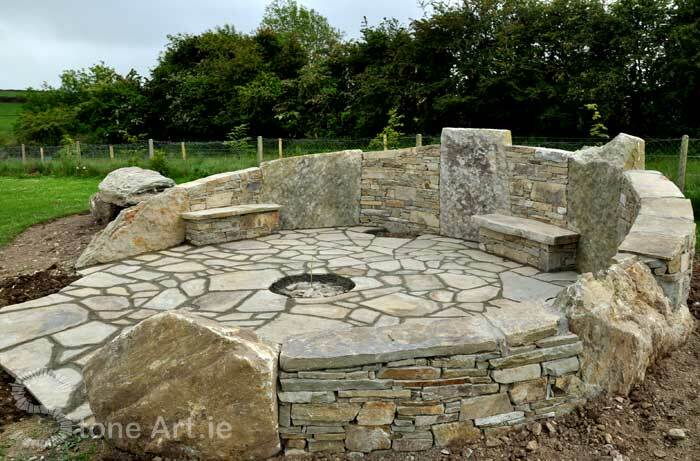 The seating area was initially designed to have a fire pit in the center but later the client decided against the fire pit. I still wanted to have some sort of central feature, so I decided to put in a mosaic instead. 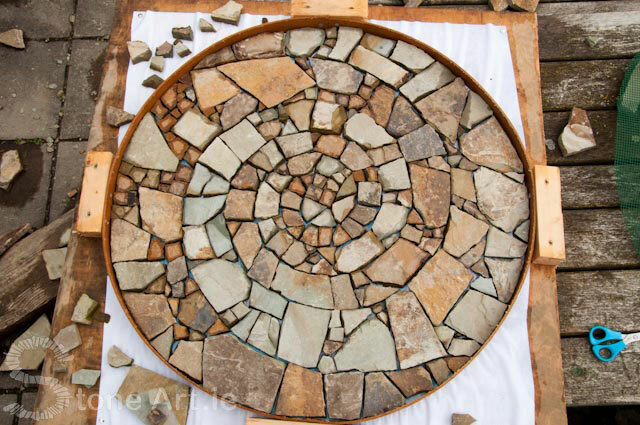 I have been getting a lot of reaction to the mosaic I made for the center, I also have been getting some feedback from readers saying that they would like to see some more DIY projects posted on the blog. So I thought, why not show how I made this mosaic so people can give it a go themselves. 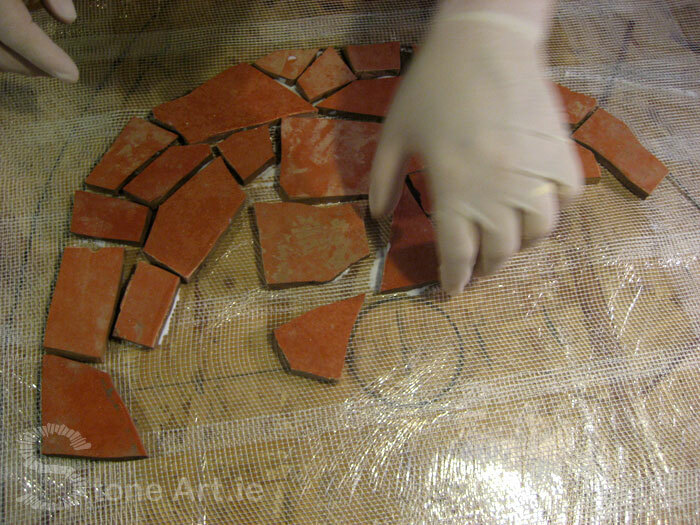 I am in fact going to show two different ways of making mosaics. The first is made the more traditional way, using floor tiles of the same thickness, and the second way (which was a bit of an experiment) involved making a sort of upside-down mosaic cake! 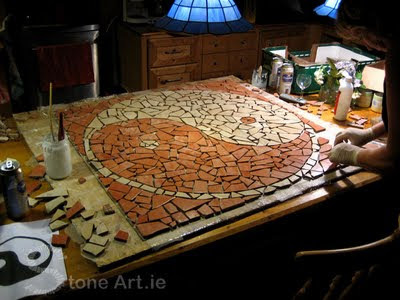 Mosaics are relatively easy to do and are a great project to get the whole family involved in. They make great features in a garden patio, on a wall or in a summerhouse. Anyone who has been to Gaudi’s, Park Güell, in Barcelona, Spain will know the endless creative possibilities with mosaic art. 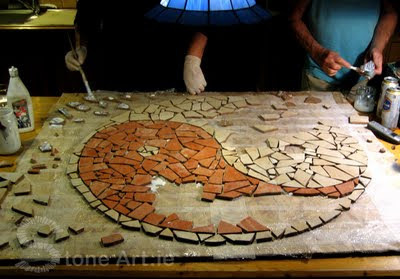 The first mosaic I will demonstrate is the more conventional tile mosaic. 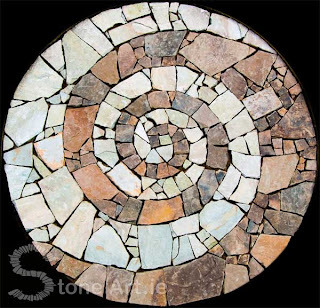 This type of mosaic can be pre-made and slid into place later. This method is great because this means that it can be made on the kitchen table where the whole family can get around and be involved, it also means that it can be completed over a period of time. This is in fact a mosaic I did for my parents some years back, I was finishing up a tiling job when I realised we were going to be short of tiles, the tiles were relatively cheap so the boxes came with many broken tiles. 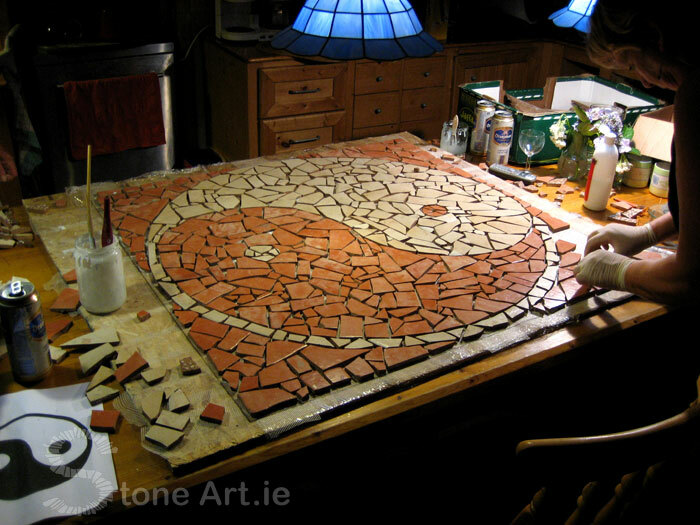 So I thought why not put the broken tiles to good use and make a mosaic (and save a trip to the tile store in the process). So here are a few things you will need if you are going to give this a go! A piece of plywood (or something similar) large enough to fit your mosaic on. The first step is to decide on your design, in my case it was a yin yang symbol, but be as creative as you like. 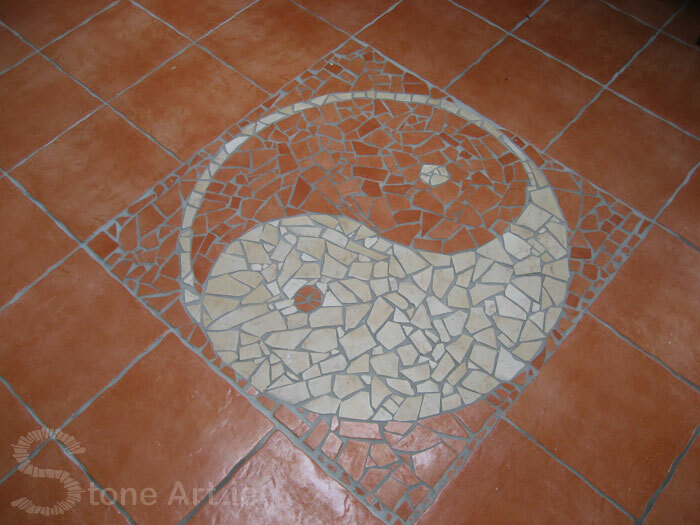 Or if you are lacking inspiration, you can also find many mosaic designs and templates on the internet. When you have decided on a design, transfer the design onto your sheet of plywood to the scale you desire. Next stretch plastic wrap over the board (this will prevent the mosaic from sticking to the board). Then lay your tile mesh on the board. Use some tape or tacks to keep the mesh in place. If you are finding it difficult to see the design you may want to retrace the design onto the mesh. 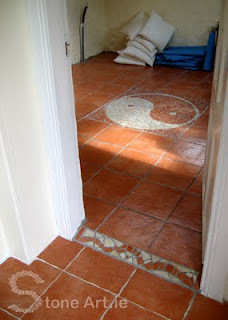 If you are using old tiles try and use tiles of the same thickness as it will give you a more even finish. Also take care when breaking up the tiles as the tile fragments can be sharp, be sure to wear gloves and eye protection. It is also advisable to lay an old towel over the tiles as you break them to prevent the fragments from flying around the place. It can be quite tedious getting all the pieces to fit together like a big puzzle, but try not too worry about the gaps between the pieces as once they have been grouted you won't notice the gaps. To fix the mosaic in place, get some tile glue either premixed or in powder form (just be sure that the glue is suitable for exteriors if the mosaic is outdoors, rapid set is also preferable). Using a tiling trowel spared an even layer of glue on the surface where the mosaic will sit, then carefully slide the mosaic into place. Lightly press down on the mosaic so that the glue starts to push through the mesh but try not to get it coming to the surface. Wipe off excess glue and leave to set. 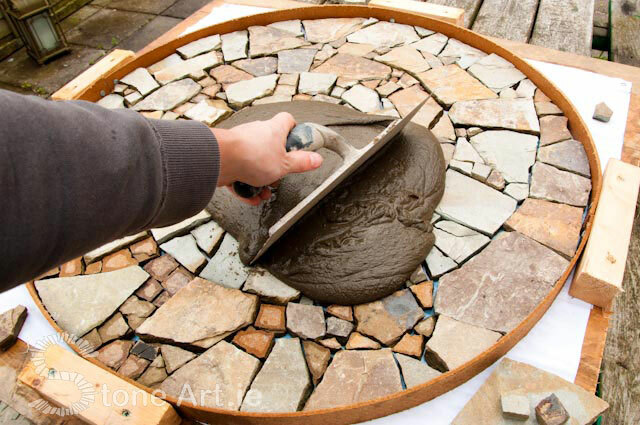 Once the glue is set to the manufactures specifications, mix up your grout (again make sure the grout is suitable for outdoors) and squeeze into the gaps with a squeegee and remove residue with a sponge when it starts to set (usually only takes a few minutes). And there you have it, one finished mosaic! 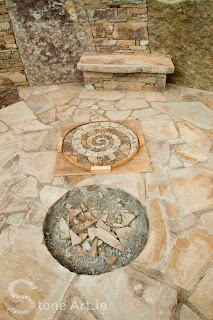 So now I will show you the process I used to make the spiral mosaic for this seating area below. 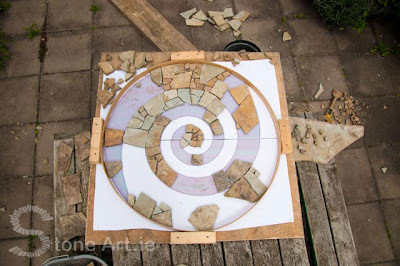 So this mosaic was a bit of an experiment because I needed to make it off site, but I could not make it the conventional way (as above) either as I would be using natural stone which would be of variable thickness resulting in a very uneven finish so I decided I would try and make it similar to an upside down cake, that way the finished mosaic would be perfectly smooth and even. There are probably better ways of doing this, but I will now demonstrate the process I used to make this mosaic, using the materials I had to hand in my little garden shed. 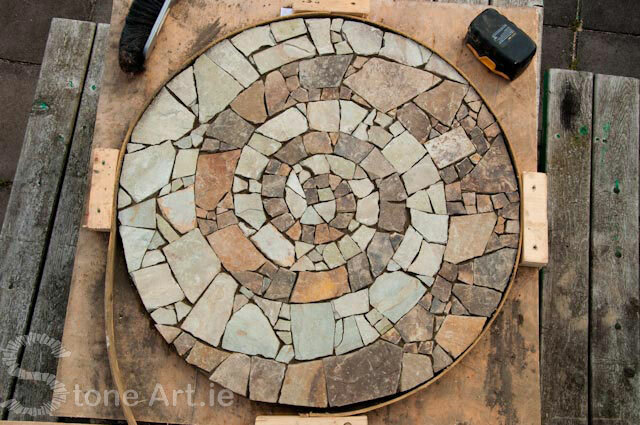 So first of all, I knew I wanted to make a spiral and that it had to be a circular shape just under 80cm in diameter as this was the size of the hole I left in the paving for it. I also wanted to use the same stone I used to create the surrounding paving, so before leaving the site I collected a number of pieces of stone averaging a thickness of about 1cm. In order to get a clear design I only selected pieces that were either light grey or dark brown, to maximize the contrast. 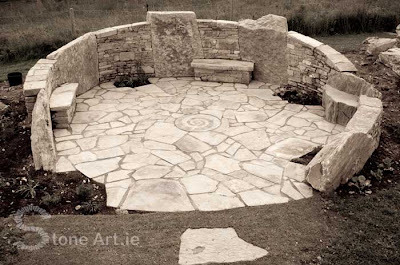 I then took my measurements and my stone home with me to work on over the weekend. 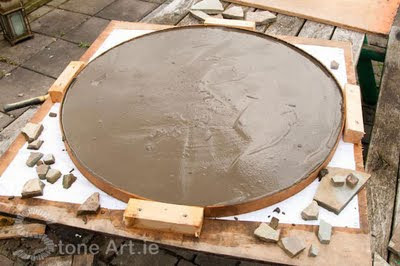 I then attached the template onto a piece of plywood (approx 1m² in size) and drew a box around the outside of the circle. At the four points where the box and the circle meet, I attached pieces of 2”x2” timber onto the plywood, then using some strips of hardboard (nice and flexible) that I had laying in the shed, I created the circular mould that would contain the mosaic, by connecting the hardboard strips to the 2”x2” timbers I connected to the plywood. The picture above shows all the stones placed, however the contrast between the two coloured stones does not seem great. This is of course because we are looking at the underneath of the mosaic and I have the most contrasting sides of the stone facing away. I then mixed up a half bag of cement fondue I had in the shed with some sand and water in a bucket into a creamy mixture (not too wet mind you) that would seep into the cracks (a bag of quick drying cement should work fine as well) I then poured half the mixture on to the mosaic and spread it out, careful not to move any of the stones. 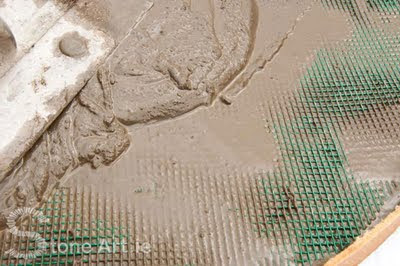 I then added the plastic mesh and poured the rest of the mixture on top so that the mesh was sandwiched in the middle. I then left it for a few hours to set. I waited till it was set long enough that it was hard but still soft enough that I could scratch the surface, the reason for this I will explain in a second. So the next task was to flip the mosaic over, to see if the experiment worked at to see if there was enough of a contrast between the two stones to show up the spiral properly. 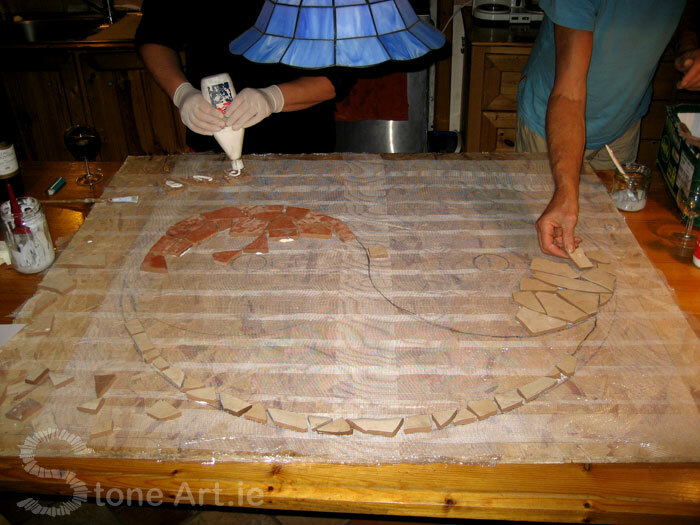 To do this I put another sheet of plywood on top of the mosaic and screwed it into the 2”x2” timbers below, sandwiching the mosaic which allowed me to flip the mosaic over safely without damaging it. Then sliding the mosaic to the edge of the table I was able to take the screws back out and reveal my creation. All that was left to do now was scrape any excess cement from between the cracks using a pointed tool (I used a pointed screwdriver and a nail) and brush clean. Because the cement was not completely set yet I was easily able to remove the excess glue. From here the only thing left to do was transport the mosaic back to site and slide it into the hole on a bed of cement and grout it with a grey grout using the same technique mentioned earlier. So I hope this has inspired some of you to give mosaicing a go, and hopefully some of the information here will help you along the way. 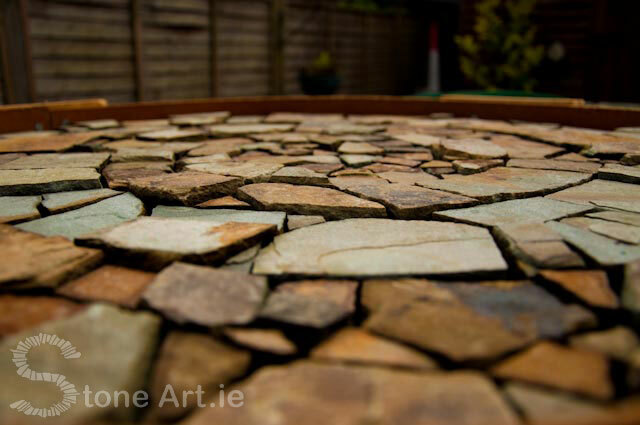 If you do give it a go, please post a photo of your mosaic creations (or indeed any of your other garden stone art creations) on my stone art facebook page so I can have a look. As for the rest of you who don't already know my facebook page do pop in and give us a 'like', I update the facebook page every few days with lots more interesting things as well as mini post, photos and more. What great and very clear instructions. It left me feeling like I could do this. Maybe one day when I return to Canada, I will get my act together. 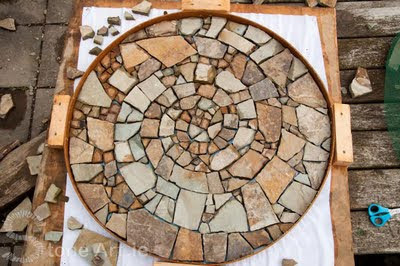 Thank you so much for posting such clear instructions on how to make a stone mosaic. Your work is absolutely phenomenal. I have watched the video, too and was just amazed. Looking forward to seeing all of your new creations in the future, you are a true Artist. Beautiful! I've bookmarked this post, I so want to try something like that. experience, but I am not sure I'm ready for a mosaic! Since I love making mosaics myself, as soon as I saw your post was about mosaics, I zoomed over. Great instructions! And the pieces look wonderful! My dream is to one day see Gaudi's work in Barcelona. I'm tired of pounding rock. 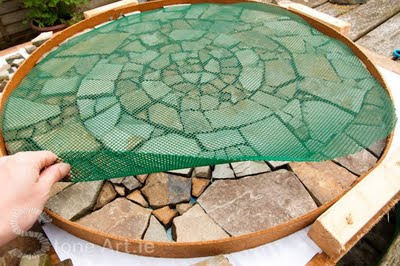 Soon as the boulder birdbath is finished I'm going to try creating some patio 'inserts'. Thank you for writing this! Wonderful artwork and interesting and informative instructions. 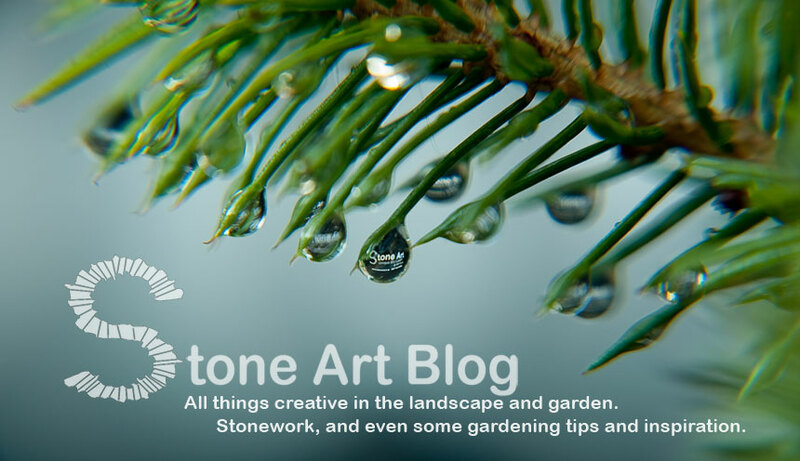 I also like the design of your blog. Blessings! You have inspired me with so many ideas! Thank you for the wonderful instructions!! 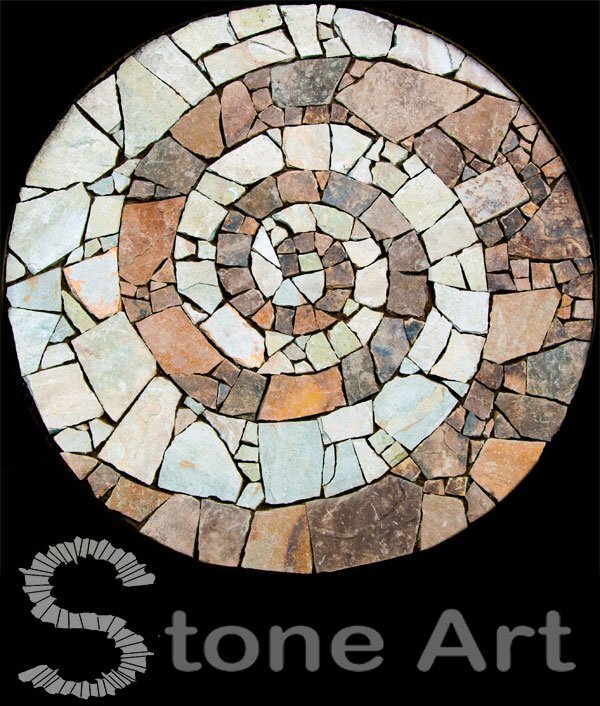 I usually do bright color in my work, but I can't wait to use the natural beauty of stone and its various colors! Thank you so much for this great idea. While reading i remembered an old technique. Before pouring the cement you could fill the cracks for 1/3 with sand. That way you don't have to scrape off any cement that came through. You can easily brush away the sand once you flipped over your work. I was wondering are you able to leave it dry completely then place it in its place? Thank you for the instructions. Thank you so much for posting these instructions! I love what you have done with these mosaics. Love your work! What proportions are used when you mix cement fondue to get the right consistency? And how thick? Like pudding or thicker?